To sprout buckwheat: place the raw buckwheat grouts in a glass container and fill with water. Place a lid on it and store it in the fridge overnight to soak. In the morning, drain and rinse, then tip the container upside down onto a kitchen towel. Allow to sit for 1 hour to make sure all of the water has escaped. Flip right side up and leave on the counter for 24 hours. At the 12 hour [or so] mark, fill with water and drain again and follow the steps above. Your buckwheat should be ready at the 24 hour mark! Spread out onto a kitchen towel to make sure most of the moisture is removed. 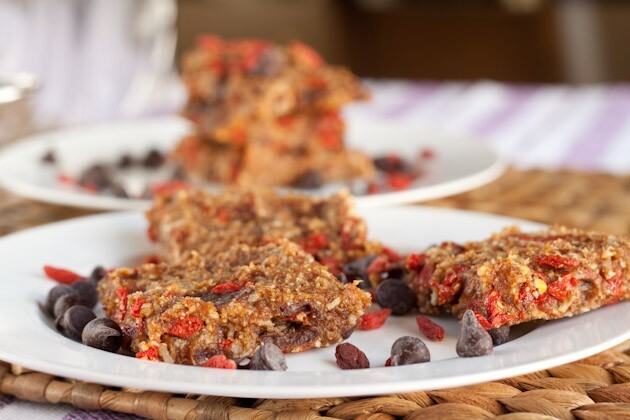 To make bars: place dates, almond meal, buckwheat, coconut, vanilla, cinnamon, and salt in a food processor. Process until desired consistency is met. 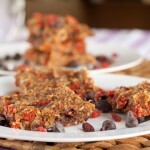 Drop mixture into a large bowl and mix in goji berries and carob chunks. Line a 9×9 square pan with parchment paper across both sides for easy lifting and push mixture into prepared pan. Option #1 if you don’t have a dehydrator: Place in the freezer for an hour to harden before cutting into uniform squares. Enjoy from the freezer or at room temperature. Option #2 if you do have a dehydrator: Place in the freezer for 10 min to set before cutting into uniform squares. Place cut bars in the dehydrator on 115F for 8-10 hours.